Singulair is a trade name for the generic drug montelukast primarily used for the management of symptoms of asthma and hay fever (seasonal allergic rhinitis) and is classified as a leukotriene inhibitor. Leukotrienes are chemicals produced by the body in response to inhaling an allergen (such as dust or pollen). These chemicals can lead to swelling, congestion and tightening of the airways, nasal inflammation, and the general discomfort allergy sufferers are so familiar with. Approved by the FDA in 1998, Singulair is manufactured and distributed by Merck & Co., Inc. Currently, generic montelukast is not sold in the market although it is available under a different brand name – Montelo-10. Singulair is available only by prescription and in various drug formulations: 10 mg tablet, 4 mg and 5 mg chewable tablet, and 4 mg packet of oral granules for adults and children at least 15 years of age. Children between 6 and 14 years old can take a chewable Singulair tablet of 5 mg. Children between 2 and 5 years old have the option of taking a chewable 4 mg tablet or the same dosage in the form of oral granules. Oral granules can be dissolved in the mouth or stirred into food or drink for easy dosing of even the smallest patients. Singulair is primarily used in the management of asthma attacks in adults and children over 12 months of age. It may also help relieve symptoms of allergy particularly sneezing and runny nose in adults and children over 6 months of age. This medication should not be given to a child without healthcare provider’s advice. This once-a-day treatment provides relief from the discomfort of common allergy symptoms. Singulair may also be used as a long-term treatment option for patients with asthma. Singular is not designed to treat sudden onset symptoms, so patients with asthma should always have a rescue inhaler on hand as well. Singulair may also be prescribed to prevent narrowing of the airways due to exercise (exercise-induced bronchonstriction) in adults and teens aged 15 years old and are not yet taking this medication for other purposes. If you are already using Singulair for relief of allergy symptoms or prevention of asthma, do not take another dose for exercise-induced bronchoconstriction. Your healthcare provider may also prescribe Singular for other purposes not discussed in this medication guide. Leukotrienes are naturally occurring compounds in the body that promote inflammation of the lung tissues in response to allergens or other diseases, such as in hay fever and asthma. These compounds are produced and release by cells and then bound with other cells associated with inflammation. Singulair works by preventing luekotrienes from binding with cells that cause inflammation. This provides relief for allergy symptom, such as sneezing and runny nose. It also prevents tightening of the airways. Read your prescription label carefully and take this medication exactly as prescribed by your healthcare provider. Do not take more than or less than the recommended amount. If used for treatment of asthma or allergy symptoms, Singulair is usually taken once a day in the evening. If used to prevent exercise-induced bronchoconstriction, it should be taken at least 2 hours before engaging in physical activity, and should be taken only once within any 24-hour period. Follow your healthcare provider’s instructions. If you are taking Singular for allergy or asthma, do not take an extra dose for exercise-induced bronchoconstriction. The regular tablet should be swallowed whole with a glass of water. It may be taken with or without meals. If using the chewable tablet, it must be chewed completely before swallowed. If using the oral granules, it can be put directly into the mouth and swallowed. Oral granules may also be mixed with a spoonful amount of liquid such as ice cream, applesauce, rice, or mashed carrots. For pediatric use, it may be mixed with 1 teaspoon of breast milk or baby feeding. Do not mix granules with other type of liquid although you can take liquids before or after taking Singulair. The oral granules must be used within 15 minutes after opening the packet. Opened packet may not be saved for later use. Singulair should not be used as a rescue medicine for an asthma attack. Use a quick-relief inhalation medicine to manage asthma attack. Consult your healthcare provider if any of your asthma medications do not seem to be effective in managing or preventing attacks. Continue taking Singulair for maximum benefit. It may require several weeks for your symptoms to improve. If symptoms persist after several weeks or if you feel like you need to take more than one dose in a day, talk with your healthcare provider. Asthma treatment requires a combination of drugs. Take all the medications exactly as instructed by your healthcare provider. Do not adjust your dose or stop taking the medication without approval of your doctor. Contact your healthcare provider if you experience any change in mood or behavior, depression, anxiety, or suicidal ideations. Chewable tablets contain phenylalanine. Inform your healthcare provider if you have phenylketonuria. 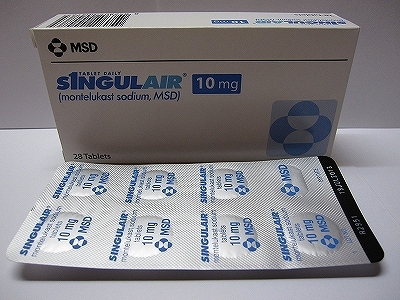 If you have allergy to montelukast, do not take Singulair. Talk with your healthcare provider about all allergies you have.